With various trips home for the holidays, I've been listening to some great audiobooks! 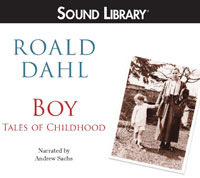 Boy: Tales of Childhood by Roald Dahl is based on events from his own life, but reads just like fiction. Andrew Sachs provides hilarious narration that makes the book really come to life. I'd highly recommend this to any fans of Dahl or anyone with middle grade kids looking for a great family listen. 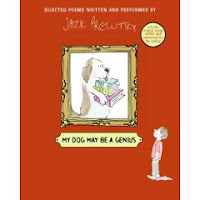 Another great family listen (especially for families with older preschoolers or younger elementary kids) is My Dog May Be a Genius by Jack Prelutsky. The fun thing is that each poem in this selection is set to music and sung. The tunes are sometimes repeated, but a host of different musical instruments (guitar, bango, mandolin, and oboe to name a few) make each song fun to listen to. The silly words will have kids howling and begging for repeated listens. One that's great for teens is The Compound by S.A. Bodeen. Fifteen-year-old Eli has spent the last six years with his family in an underground compound created by his billionaire father to protect them in the event of nuclear war. But as events unfold, Eli starts to suspect that his father may have lied about there being a war... and now he won't let them out. The story goes to some bizarre places, but it was compelling listening. I read Good Masters, Sweet Ladies by Laura Amy Schlitz last year after it won the Newbery. I really enjoyed this recording, read by various actors. I'd recommend it as supplemental listening to those who have enjoyed the book or as companion listening with the book in front of you. I don't know it would stand alone very well if you haven't read the book and you certainly won't want to miss the illustrations of the print book. 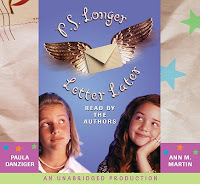 And las t, but certainly not least, I listened to PS: Longer Letter Later by Ann M. Martin and Paula Danziger. I've been meaning to get to this one for awhile, as Martin and Danziger were two of my favorite authors growing up. This story is told in letters between two best friends. When Tara has to move to another state, Elizabeth's not sure how she'll get along without her best friend. While Tara's family seems to be finally getting its act together, Elizabeth's is starting to fall apart. I especially enjoyed that the book was read by both authors - Ann M. Martin reading Elizabeth and Paula Danziger reading Tara. It was a treat to hear these authors that I love and I don't know that professional actors could have done any better. This is a great choice for families with daughters or middle grade best friends taking a trip.